In order to have your domain show Internet files, web pages, and more, you’ll need web hosting. In the above video, I explain the process of setting up an InMotion Hosting web hosting account. Save 30% instantly on InMotion Hosting, the most reliable host I’ve found. Select the best shared hosting plan for your needs. 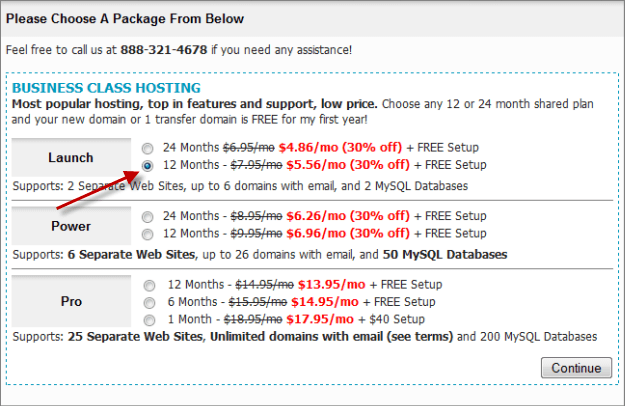 Register a free domain with InMotion Hosting for the first year (site exclusive). Select the right server for your web hosting account. Avoid paying extra for domain privacy if registering through InMotion Hosting directly. Remember: Without being logged in, you’ll be served the video from YouTube with advertising, annotations, and distractions. No account? Register free (or donate). Save 30% on any business web hosting plan. Activate 30% InMotion Hosting DiscountClick here to activate discount and follow video. If ordering the Launch plan and if you want to spend the least, select the option shown by the red arrow that says 12 Months – $5.56/mo (30% off) + Free Setup. Once selected, click the continue button on the bottom right. On this screen, you have one of two options available to you. I’ll explain what these options mean to you. I would like to purchase a new domain – If you do not own a domain name such as webhostingchoose.com, you’ll need one to start your website. On this screen, you can type your domain name you’d like to register and then click continue. I already own this domain or will handle the registration separately – If you’d like to use an existing domain name or register your domain on another service like GoDaddy, then click this option and type your domain name that you have either pre-purchased or own. Now that I’ve explained the options, there’s a couple things you should know. First, by using this website, your domain name registration is actually free, a $11.95 value for your first year. This is another exclusive promotion that you aren’t likely to see anywhere else. Second, if you’d like to use GoDaddy as your domain registrar, check out my GoDaddy domain registration video tutorial. Every host does this. Just click continue to proceed unless you really want the Power plan upgrade to maximize your plan features. The tuning option is a great feature because it allows you to specify the type of server you’ll be placed on. If you plan to run any sort of website that uses a database and PHP such as WordPress (see WordPress Training Series here), then select the “Site may also use programming and databases” option. Below that (partially covered in the screenshot above) is the Max Speed Zone. West – Use this option if you and most of your audience will be on the West side of the United States. East – Use this option if you and most of your audience will be on the East side of the United States. Not Sure – This allows InMotion Hosting to choose the best option for you. You’ll have the option to change this setting later if needed. Unless you have a reason or need to have domain privacy, I’d recommend switching this to “No Thanks” so that you get a FREE domain without additional fees. If you do not switch it, you’ll be charged a $9 fee on your credit card for domain privacy. Other than that, fill in all of your information as accurately as possible and fill in your credit card details to make the purchase. Under “Referred by” I’d appreciate it you put webhostingchoose.com in there, but this is not required. Have a question? Feel free to leave your question in the comments below and Scott will answer! Be sure to subscribe to comments so that you’ll be notified when Scott submits a reply. Not sure about InMotion Hosting? See Scott’s InMotion Hosting review, this site is hosted by InMotion Hosting. I practice what I promote. You can trust these guys! What’s My Cost Scott? If you follow the above steps, your total cost is $66.78. Anything extra means you’ve missed a step, added features, or you live in a country subject to the VAT. I Need help with the process? Leave a comment below and I’ll gladly assist you. Thank you for supporting what I’m doing here, I sincerely appreciate it!